40080 Pencil Holder is a Friends set that was released in 2013. 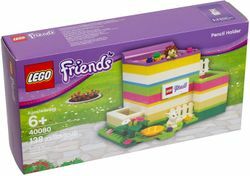 The set includes a colorful box with a Friends logo on it to put pencils in, a hedgehog and flowers to decorate the box. Facts about "40080 Pencil Holder"
This page was last edited on 9 January 2016, at 12:50.